Schematic for site where infiltration is not feasible. Note impermeable liner and discharge from underdrain to storm sewer system. For a discussion of considerations at sites with on- or off-site contamination, see this page. Schematic for site where infiltration is feasible. 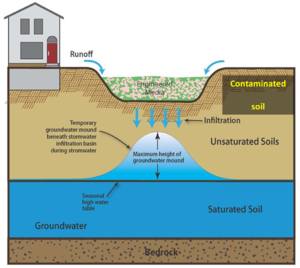 Note that contaminated soils are overlain by an impermeable surface and the groundwater mound does not extend into the contamination. Source:CDM Smith. Schematic for site where infiltration may be feasible. Although the groundwater mound does not extend into the contamination, it needs to be determined if water will infiltrate through the contaminated soil and transport pollutants at levels of concern. Source:CDM Smith. For a discussion of considerations at sites with on- or off-site contamination, see this page. Warning: The Construction Stormwater General permit prohibits permittees from constructing infiltration systems where infiltrating stormwater may mobilize high levels of contaminants in soil or groundwater. Permittees must either complete the checklist (File:Contamination screening checklist for stormwater infiltration.xlsx or File:Contamination screening checklist for stormwater infiltration July 2018.xlsx) or conduct their own assessment to determine the suitability for infiltration. Permittees must retain the checklist or assessment with the SWPPP. For more information and to access the MPCA's "contamination screening checklist", link here. 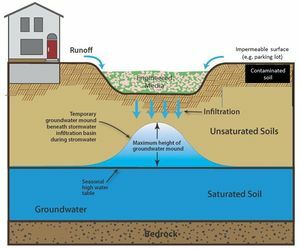 Managing stormwater at sites with contaminated soils or groundwater is challenging because the infiltrated runoff has the potential to transport contaminants in the soil to the groundwater or mobilize contaminants in the groundwater. 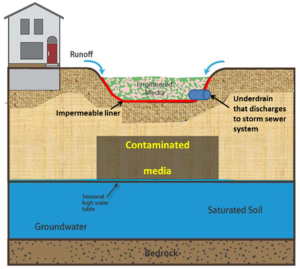 Stormwater at contaminated sites can be managed by surface capture and treatment, or as infiltration by avoiding contact between runoff and contaminated soils and groundwater. Surface capture includes filtration and sedimentation practices. When considering surface capture and treatment of runoff at contaminated sites, the surface capture treatment system will usually need an impermeable barrier to prevent infiltration and potential mobilization of contaminates in soil or groundwater. When considering stormwater infiltration at contaminated sites, it is essential to develop management options to ensure contaminants are not mobilized. To accomplish this, a project proposer must understand site conditions (e.g. soils, hydrogeology, land use), the nature and extent of contamination (i.e. site conceptual model), and applicable regulations. The following pages provide information on these topics, including case studies and links to additional information and guidance. This page was last modified on 1 November 2018, at 14:20.